I bought this plate to be early 18th century Kangxi and altough it was broken and restored I find it strange it has no damages on the rim. It's 39cm in diameter. So the question is if it is authentic. Regards. 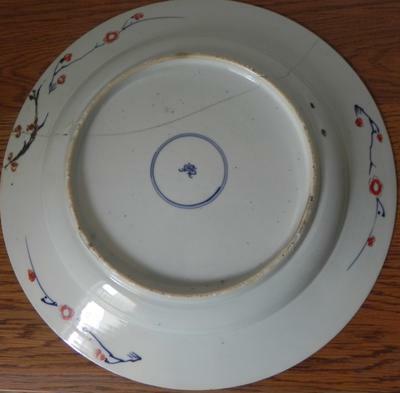 I have a found a pair of similar plates, stated is these date from 1720 and are made for the Japanese market. Kilns needed to be near located near waterways, in hilly areas. The waterways were important for transport with boats, as mostly no long distance road transport with carts existed in ancient China. Over land wares needed to be carried by humans or by animals. So boats were one of the preferred methods. The hills were needed because they were (1) covered with woods that could be used for firing. (2) The hills/mountaineous area in the surroundings needed also to be suitable for kaolin clay mining. Thus, seemingly isolated places were specifically selected for their functionality in view to operation and delivery. Nice to talk with someone who knows more than average about these things, Tim. I believe it was the growing export trade in the 16th century that lead potters from Swatow and Fujian to migrate to Jingdezhen. Troubles with raiders along the Chinese coast also forced them to flee inland. These potters brought their skills and traits, among them the practice of firing ceramics on sand, to Jingdezhen. Perhaps it was also the scarcity of traditional kiln materials at this time that forced them to fire huge orders of porcelain on beds of sand. Hence the Kraak wares with gritty foot rims. Over time this firing practice was gradually abandoned. Jingdezhen is not the most accessible of places today. Actually, it's in the middle of no where! Can you imagine the situation 300 to 400 years ago? Every piece of porcelain made had to be transported by boat down rivers and lakes, carried on foot over mountain passes, loaded onto boats again then carried on foot again...etc until the cargo reached Canton, the port of call for Western ships, or on to other places on the mainland where these wares were sold. One would imagine the entire ceramics industry would do everything it can to maximize the efficiency of order delivery when the demand is in the millions of pieces! They could start by making the ceramic bodies thinner, lighter, alter the foot rims slightly (decrease surface area) for more stackability so porters can carry more etc...Of course there is also the part where these cargoes had to be loaded onto sea-going ships with final destinations in SE Asia or half way around the world in Europe. Orders for Chinese export porcelain peaked in the 18th century. This is the period where the shape of foot rims (on plates) changed. Coincidence? I find export wares in general have a much more noticeable "slant"
in the foot rim whether they're glazed or not. I beg to differ, Tim. I see that the domestic Chinese wares also have the slanted rim, invariably, if they are from JDZ and are sandai period. The unglazed one I mentioned was probably not European export, but despite the unglazed bottom this one (and others I have seen and own) are slanted. Unglazed bottoms seem to have the slanting on the outside only. Glazed rims may be slanted on the outside or both outside and inside. But the shaved rim of European export is special. I cannot remember seeing that on other wares. Quality-wise I would place 18th century export porcelain for Europe between minyao and guanyao porcelain. Domestic porcelain is frequently of less quality, and really nice decorations seem to be relatively rare. Occasionally you can find kiln sand on export wares, but the amount of sand is really small. Don't know why this is, as quality was best during that time. The Zhangzhou (Swatow) wares which had lots of them were usually much earlier and exported to Japan, mostly 17th century. I see it also on items made in JDZ from about the Wanli reign to early Kangxi, on the same items which also have chatter marks, unglazed and glazed. That is why I asked. But of course, from the mid and late Kangxi reign onwards these were rare. Found kiln sand on a Qianlong item (European export) before. The odd thing is that all kiln sand I ever saw was on plates or bowls, never on other items. As you probably know it is common on Kraak wares, but there seems to be none on jars, etc. from the Wanli period. destroyed or sold locally at a discount. anything and everything the Chinese manufactured anymore. the final product. They wanted wares that met their tastes. as many pieces of cargo as they could fit in the ship's hold. With the slanted rims they could stack the plates efficiently. and now I can safely say that there is none on this plate, at least not like the 1600's plates. so I'll follow your discussion. If you type 'Chinese Imari' in the search option there are more examples. Good information. I have always wondered why they had that strange unglazed shape. What I know regarding the slanted rim also concerns the glazed rims, but mostly only those of plates/saucers. I have this information originally from a reliable source who attend a study course taught by, among others, leading researchers from China, here in Taiwan. Up to now I found the information regarding the rims reliable for confirming 18th century plates. 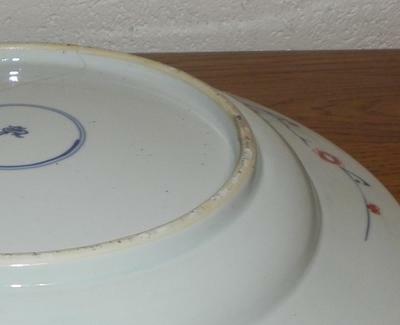 By the way, just checked a recently acquired plate with unglazed bottom, that was said to be approx. Yongzheng. It has slight chatter marks! I did not pay attention to this before. Is yours glazed? No kiln sand, I assume? Do you think it was made at Jingdezhen kilns, or Zhangzhou? I dont know if I can post the site but its on 1stdibs.com. The 3 plates dont show the back but an other ad does. Can you provide a more detailed link to the exact page? is cut obliquely on the outside and almost straight on the inside. century regarding the shape of the plate and how the foot rim should look. Apparently, the European merchants wanted a foot rim that was shaved inward so the plates could be stacked easily. As per foot rim requirements the plate could not be before late 18th century, normally. Sandai (三代 = Kangxi, Yongzheng, Qianlong) foot rims as a rule must be slanted either on the outside or both the outer and inner side of the rim. Anything straight up is from past that period. Normally, it is possible to find that type of slanted foot rim on 19th century items (especially early), probably from stores that remained from the sandai era. I do not know IF there are any exceptions, but I have never seen one on export porcelain. Would be interested to see one, in any case. The above is what confuses me. The images seem to show a straight rim. There are very specific changes of rim shapes from the early Ming dynasty to the 19th century. The rim was straight in the late Ming dynasty, not anymore from the Kangxi reign. But this is mostly true for JDZ porcelain, but may be different with other kilns. I would be more comfortable with 17th century, actually. The Shunzhi and early Kangxi reigns were a bit different in view to the body in many ways. The rim might still have been straight by then, and it could explain why the decoration looks more Japanese. Early Chinese imari decorations were likely closer to the Japanese variation than the later ones. And, if there are really chatter marks, this would about settle it. There should be no chatter marks on an 18th century item made in JDZ, normally. I think there are chatter marks. but i'm not 100% sure. 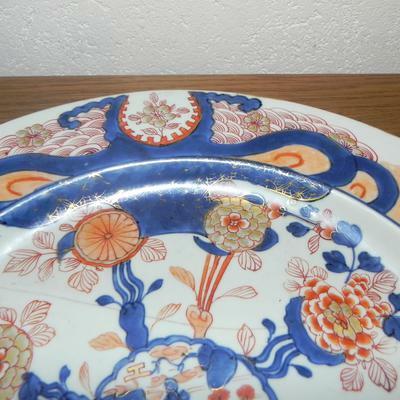 This plate is very thin, a property of chinese imari i read. The 1790 dated plates have no lingzhi mark or other marks, only the flower curls on the back. My biggest concern was that there is no chipping on the rim. So, It's chinese from 18th century, could be kangxi. Thanks Tim and Peter for the info. I learned a lot the last couple of days. 1700 to 1750 after which the Famille Rose palette dominated. Chinese Imari went out of fashion by the end of the 18th century. 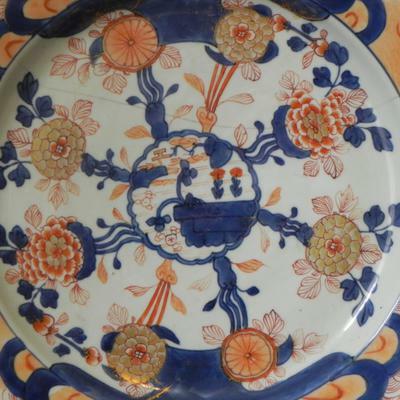 know if the other Imari plate that you referred to has decorations on the underside? Japanese in design motif and colors. it is of Chinese or Japanese origin. Thanks for all the answers. it confirmed what I already suspected, it is not 300 years old. 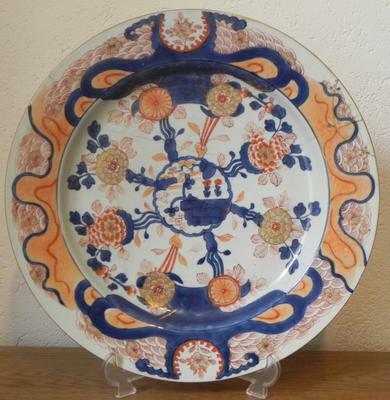 I actually found a similar plate but 22cm at an antique shop online saying that it is chinese imari from 1790. So it could well be 19th century. I'm happy that I found your site and can learn about antique china without waiting for weeks for a replay. Good work. Thanks again. of a Japanese design when it looks nothing like either one. Maybe this is a good sign that it's Chinese. The cobalt blue looks more like Chinese blue, so does the lingzhi mark. 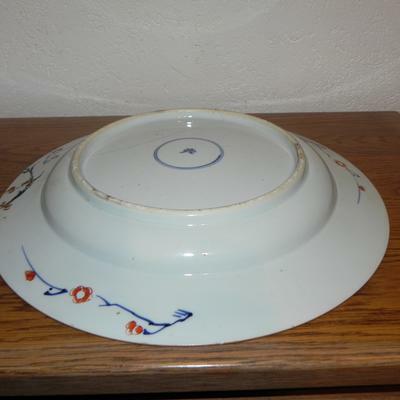 The foot rim could be okay for a larger plate from the early 18th century. The branches on the underside are done in the Japanese style, though. Maybe this too is a good sign that it's Chinese. Look for chatter marks and spur marks. If chatter marks are present, it's Chinese. If spur marks are present, it's Japanese. Thank you for the additional pictures. After looking at them I still feel unsure what this could be. The foot rim does not look like an 18th century Chinese rim, but would fit a 19th century one. The Kangxi mark does not correspond to the foot rim. The gilt corresponds to the early gilt used before the mid-19th century in China. The painted decoration looks Japanese. I cannot see anything specifically Chinese in the plate except the mark. So, I'm afraid I cannot help with this. All that I can say for now is that it obviously is old, but the mark and decoration don't fit together for me. Thanks for your reply, I've send some pictures of the footrim. It indeed was chipping of the rim what concerned me but maybe they just took good care of this plate. The other problem was the orange color but i've seen simular elsewere on your site. Hopefully the footrim image can answer the questions. Hi, not sure what you mean with damage on the rim? If you mean nochipping from knocking the plate, that resulted in the breakage - such clean breaks do happen. Anyway, overall the decoration looks Japanese to me. The underside decoration and mark conform to Kangxi, but I have doubts about the foot rim. (Foot rims differe according to the era.) Unfortunately, the foot rim is shown from directly above and the rim shape is not visible... a picture taken at an angle instead from above would allow to view the shape better. The current picture makes it appear as if it wasn't a Kangxi rim. On the other hand, a Japanese style decoration and Kangxi bottom? 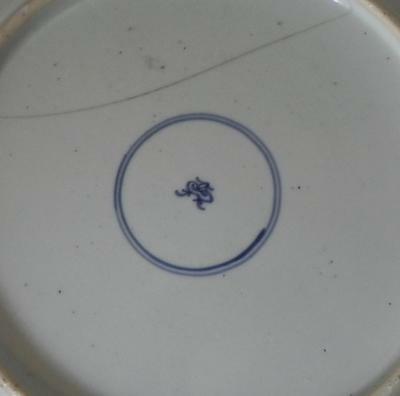 I do not know if Japanese porcelain ever used such Kangxi marks. Maybe Tim could give his opinion in view to this? I made a picture of the footrim. I also added a picture of the blue part which was painted with gold.